Proponents of hydropower development in Southeast Myanmar see dams as a reliable, cheap and clean energy source essential for the sustained development of the region. Hydropower dams would also reduce the nation’s dependency on fossil fuels. However, dam projects in rural ethnic areas have historically been the sites of violent conflict. Dams are often associated with infringements of human and socio-economic rights. Villagers in these areas often face the immediate and long-term negative impacts of dams, while receiving little in return. This is because hydropower development tends to benefit a narrow set of local and national elites. Because some of the planned hydropower dams are set to export electricity to neighbouring states, they would result in few long-term benefits for Myanmar. Many of these proposed projects are designed primarily to export electricity to Thailand or China. 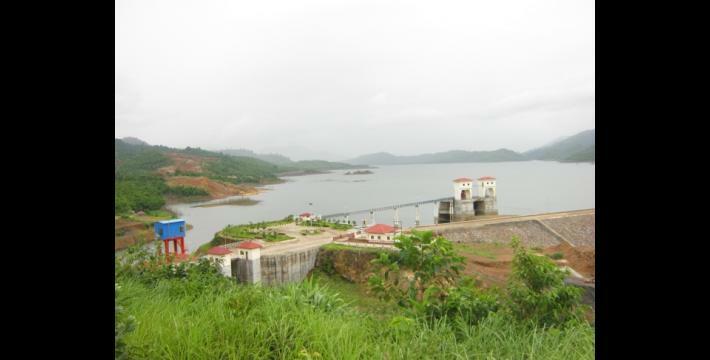 The Mong Ton (Tasang) Dam, for example, would export 90 percent of its generated electricity to Thailand. In Southeast Myanmar, electrification rates are among the lowest in the country, particularly in rural, conflict-affected areas near the border of Thailand. Myanmar’s ambitious National Electrification Plan (NEP) aims to provide electricity access to all Myanmar households by 2030. In response to the NEP and other national development goals, Myanmar’s Energy Master Plan (MEMP) projects electricity demand to rise by 10 percent annually through 2030. To meet future demands, Myanmar must expand its energy infrastructure. Currently, hydropower comprises two-thirds of Myanmar’s electricity generation capacity. Both the MEMP and alternative visions of electricity infrastructure development in Myanmar rely on hydropower as a key source of electricity through 2050, and include provisions for the export of hydropower to neighboring countries. Myanmar needs to acknowledge and address a number of salient concerns if it going to use hydropower to meet its future electricity needs. 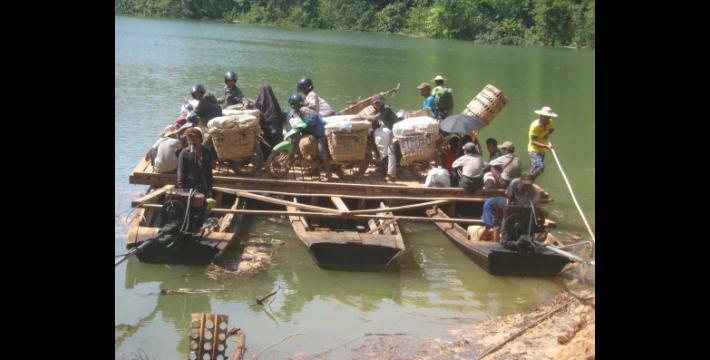 Most of Myanmar’s abundant hydropower resources are located in ethnic areas, particularly Kayin, Kayah, Kachin, and Shan States, all of which are sites of ongoing ethnic conflicts and armed tension. In many cases, development of large dams in ethnic areas has resulted in conflict, severe social and environmental impacts for local communities and human rights violations. 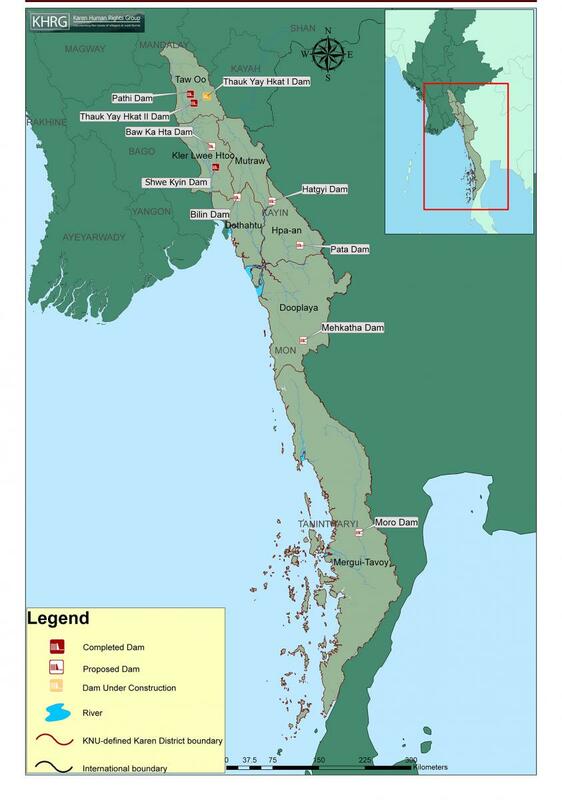 The overwhelming majority (42 of 50) of large hydropower projects planned in Myanmar in recent years have been situated in ethnic areas. 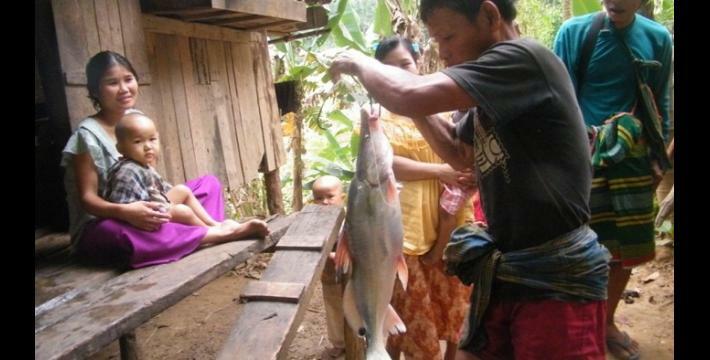 With many more projects slated for development in these areas, this report highlights how hydropower projects impact ethnic communities in Southeast Myanmar. This report aims to encourage reforms in the hydropower sector by building comprehensive recommendations for policymakers and hydropower developers. The report supports recommendations using the results of new research highlighting how hydropower projects have impacted ethnic communities in Southeast Myanmar. Report commentary assesses the degree to which Myanmar’s legal and regulatory frameworks measure up against international best standards and practices for hydropower governance. The report concludes with comprehensive recommendations on how to strengthen these national frameworks in order to provide greater social and environmental safeguards for rural ethnic communities impacted by hydropower dams. 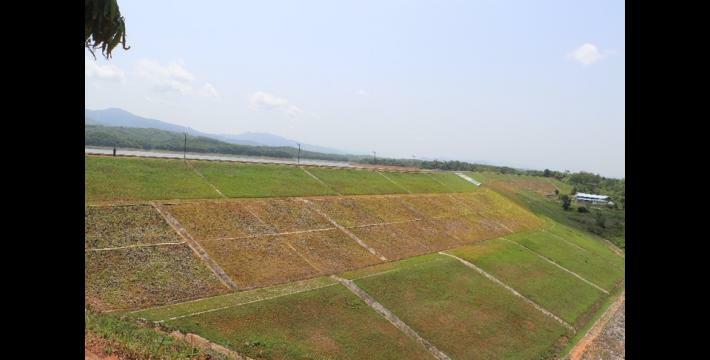 EGAT, Tyrone Henry Holding Co.Ltd. This section is designed to provide recommendations for Myanmar government authorities, Ethnic Armed Organisations (EAOs), civil society organisations and business actors that have a stake in hydropower projects in Myanmar. KHRG and KRW believe that the following recommendations are crucial to achieving inclusive development, social cohesion, and sustainable peace in Southeast Myanmar, and the Union as a whole. 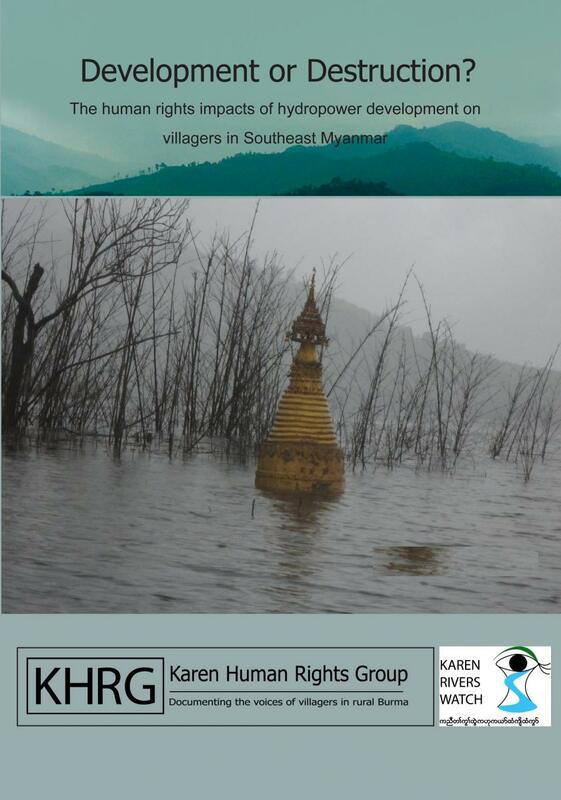 KHRG and KRW recognise that rural communities in Southeast Myanmar are disproportionately exposed to the negative impacts of large hydropower projects. The following recommendations are modelled to address experiences and demands of these rural communities. Their voices are essential in debates on hydropower governance. The Myanmar government has achieved substantial progress in bringing its investment and environmental laws in line with international laws and best practices. However, as this report reveals, the adherence to the Environmental Impact Assessment (EIA) procedural guidelines during the process of project approval needs to be strengthened. b. Conduct consultations and stakeholder engagement at national, state, township, and local levels with communities, relevant government institutions, and other stakeholders, in accordance with Myanmar’s EIA procedures. a. EIA evaluation should be held to a high degree of scrutiny. b. In absence of comprehensive Environmental Management Plan (EMP) that is deemed acceptable by the affected communities, permits must not be issued for projects with high social and environmental risks. c. MOEE and MONREC should work together to proactively identify potential environmental and social issues and work to alter the project at the Concept and Pre-Feasibility Phase stage rather than waiting for the feasibility assessment and environmental and social impact assessment process to be commenced. a. Translating the EIAs and EMPs, and their compliance monitoring documents, into local languages. b. Ensuring that these documents are accessible and readily understood by local communities. Because many hydropower projects were approved before EIA requirements were mandated by Myanmar law in 2016, they lack comprehensive assessments of the impacts on local communities. 4. To remedy this situation, the Myanmar government should ensure that projects approved before 2016 are required to produce EIA before project implementation takes places, and that they are not exempt from the scrutiny required by the modern EIA procedures. 5. Ensure that hydropower projects do not jeopardise peace and stability, by respecting the commitments enshrined in Chapter 3 of the NCA. 6. 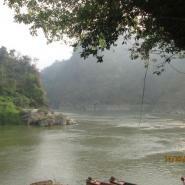 Require actors to undertake comprehensive conflict vulnerability assessments for hydropower projects in ethnic areas. 7. 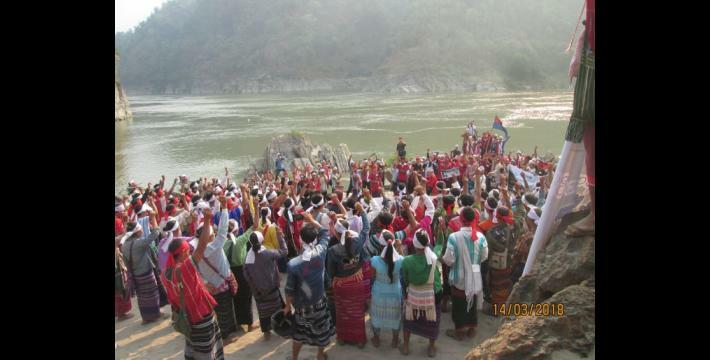 The Myanmar Government must assure that implementation and planning of large scale hydropower projects in Myanmar Ethnic areas should be suspended until a comprehensive nationwide peace agreement is reached. 8. Civil society actors are able to freely and without intimidation advocate for their objectives. 9. No barriers are set in place for villagers to benefit from the material, technical and legal aid offered by civil society actors. 10. The villagers whose lands were arbitrarily confiscated are not subjected to legal harassment or intimidation by businesses. 1. Adhere to EIA procedures to minimise the environmental and social impacts of hydropower dams on local communities impacted by them. 2. Consider EIAs, as mandated by Myanmar laws and regulations, to be the bare minimum standard that companies should aim to surpass. 3. Ensure that consultations are held early in EIA mapping processes, and continue throughout project implementation. In doing so, community concerns can be incorporated in the design, implementation and operation stages of hydropower projects. a. Bearing all community’s expenses related to the participation in EIA and consultation processes as mandated by EIA Procedure. b. Holding consultations in easily accessible locations and during flexible hours. a. Holding consultations in local languages, and disseminating information in a way that is sensitive to the local context, avoiding the use of overly technical terminology. b. Facilitating the participation of groups traditionally excluded from decision-making processes, including women and minorities. 6. Ensure that newly available information relevant to the project planning, implementation and operation stages is made continuously available throughout the project timeline. 7. Undertake comprehensive conflict sensitivity assessments and plans to mitigate possible risks of building hydropower dams in ethnic areas. a. Identifying potential unintended consequences in conflict-prone areas and developing comprehensive plans to address them before and throughout the consultation processes. b. Build trust with local communities to achieve a higher degree of public participation in consultation and planning processes. c. Affected communities should remain the core focus of consultation processes, EAOs and other armed groups should not pose as affected communities’ representatives throughout the project cycle. 9. Adhere to International Finance Corporation Standard 7 on Indigenous Peoples and Performance Standard 5 on Land Acquisition and Involuntary resettlement as guiding principles for hydropower project-related land acquisition procedures. 10. Ensure that negotiations with the affected communities are held to define adequate compensation, considering different types of remedies, such as monetary compensation, offering land of equal value, or alternative compensation packages. 11. Ensure that commitments on compensation are followed through by formalising legally binding agreements between the company and affected villagers. 12. Ensure that the type and amount of compensation provided will be distributed in a transparent and fair manner to different community members. 13. Ensure that affected communities are not coerced or threatened into accepting compensation packages that they deem unfair or inadequate. 1. Distributing a share of the profits from hydropower dams to local communities. 2. Including benefit sharing in the hydropower dam’s planning, separate from compensation and mitigation packages. 3. Considering diverse benefit sharing mechanisms, including direct payments, community development funds, employment and supply chain opportunities, associated infrastructure or public service investment. The above photo was taken on March 2018, International Day of Action for Rivers. 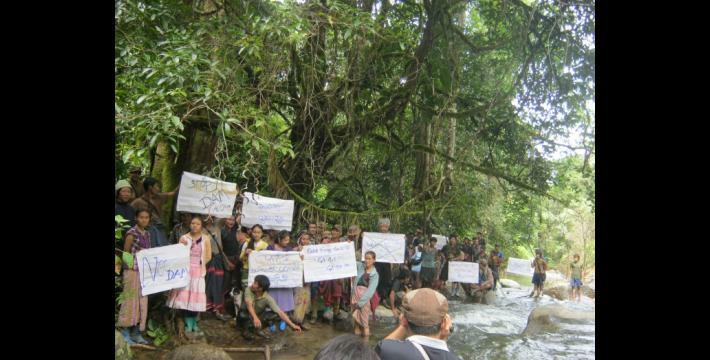 This photo shows local ethnic community members protesting the construction of the Hatgyi Dam. 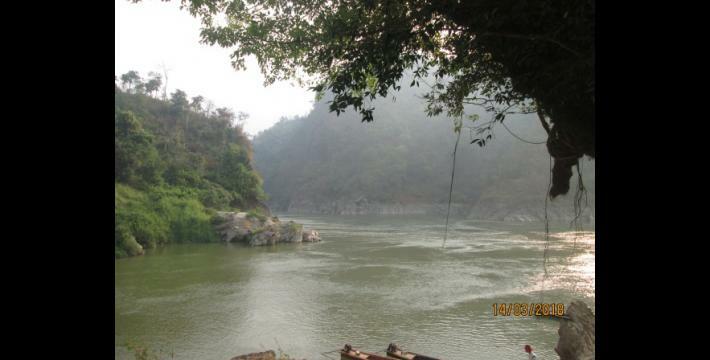 The above photo was taken on March 2018 and shows the Salween River on which the Hatgyi Dam will be built. 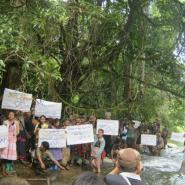 If the dam is implemented, it will flood plantations which villagers rely on for their livelihoods. 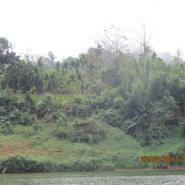 The above photo was taken in January 2012 in Htee Tha Daw Hta Village Tract, Bu Tho Township. 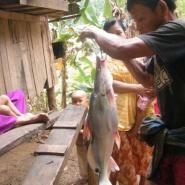 The photo shows a local fisherman who supports his family with the money that he earns from his fishing business. Villagers who rely on the rivers to obtain their livelihoods worry that they will face difficulties if the dam is implemented. The above photo was taken in February 2017 and shows the Tanintharyi River where the Tanintharyi Dam will be built. 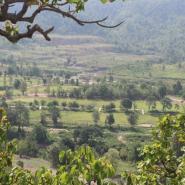 It shows villagers’ betel nut orchards which are located close to the Tanintharyi River. 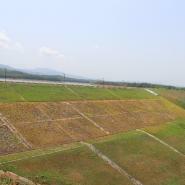 If the dam is built, villagers’ plantations will be flooded. 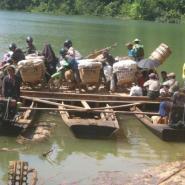 The above photo was taken in 2012 and shows villagers using a boat [known locally as ‘Zat’] to travel. The roads were flooded during Thauk Yay Hkat II Dam construction. No new roads were constructed after the flooding. This is the only way villagers can travel to other villages. 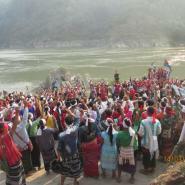 The above photo was taken in September 2012 and shows local ethnic community members protesting the Thauk Yay Hkat Dam after their land was flooded. Villagers received no compensation for their losses. 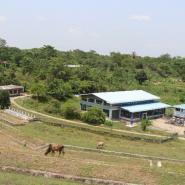 The above photo was taken on May 2018 and shows villagers’ confiscated lands which were used to build a golf resort. 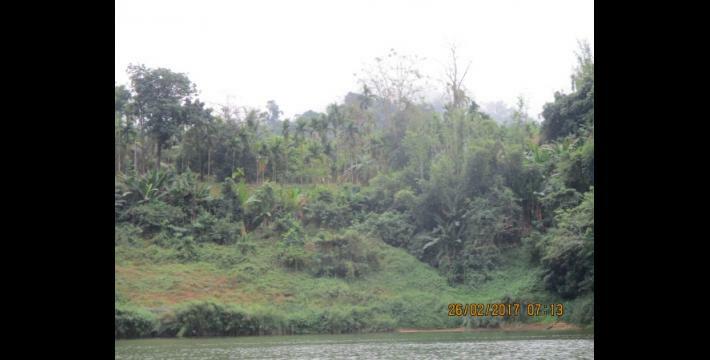 Villagers’ lands were confiscated for the construction of for Thauk Yay Hkat II Dam. 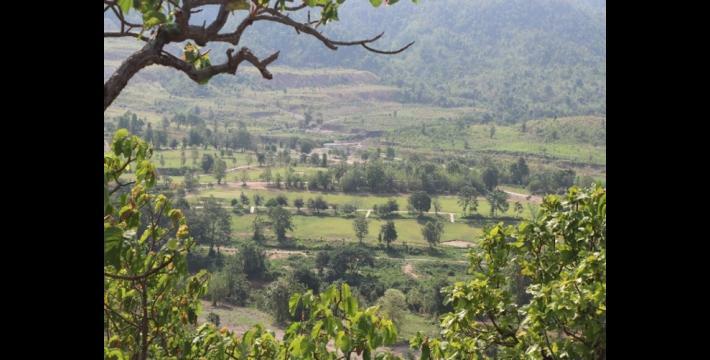 Leftover land after the dam was completed was not returned to villagers, but was instead used by Asia World and Aung Myanmar Aung companies to construct a golf resort, school, clinic and a water factory. These services are only available to company employees. Local ethnic communities must travel long distances to access health and ediucation services. 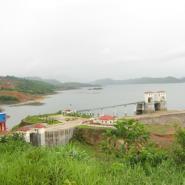 The above photo was taken in July 2012 and shows Shwegyin Dam. Thirty villages were flooded during the construction of the dam. 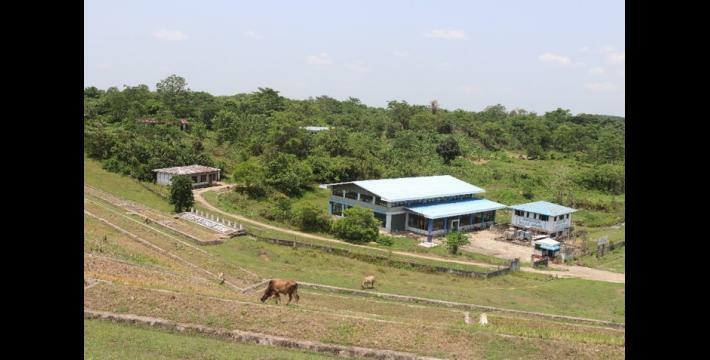 The above photo was taken in May 2018 and show the Pa Thi Dam reservoir and electrification factory which were constructed atop of villagers’ homes, lands, and plantations.